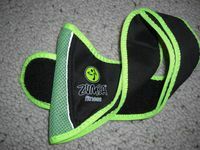 This belt accessory came with the Zumba Fitness 2 box game for the Wii. The belt is used by putting the Wii remote inside the belt and then putting the belt on. This is done so that the Zumba game can read the players hip movement and not their hand.